Pawan Mishra is a leader in the technology and finance industries. He completed his education at the Indian Institute of Technology, Kanpur. He spent the first eighteen years of his life in the small town of Aligarh in India and discovered his love of storytelling, reading, and writing during this time. In his debut novel, Coinman, Pawan Mishra plays to those who have ever felt stymied by the bureaucratic process of office life, successfully and mercilessly capturing the inertia and ennui that's inherit in most corporate cultures. Pawan now lives in Morrisville, North Carolina, with his wife, Ritu, and two daughters, Mitali and Myra. 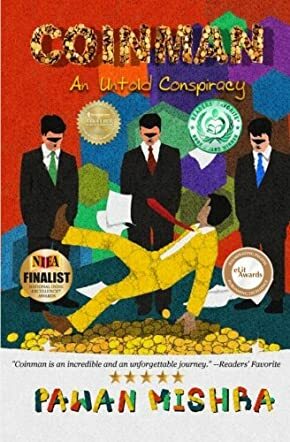 Coinman: An Untold Conspiracy by Pawan Mishra is an incredible and unforgettable journey. A debut literary novel by a new talented writer. I was easily entertained by the well-written tale. This enchanting story took me deep into its plot and set me upon an unknown and remarkable journey. I loved how Pawan Mishra brought in a little bit of an Indian lifestyle and culture to the piece at hand. Highly suspenseful, this story made sure that I never knew what to expect until it occurred. The pages are vivid in description and the narrator's point of view made me more curious to read further. The novel itself moves fast and is set in an office environment. Co-workers are not always the nicest people nor the easiest to deal with, yet here I faced an entire set of office workers going against one man. This particular man was nicknamed Coinman. He always has a hand holding coins in one of his pockets; never does he use both hands and when he has to use both, he makes an excuse to leave. Everything about him annoys his co-workers and they set out to plot against him. A business firm that turns violent, a conspiracy in the works, and a spy among the co-workers. The unfolding of events in this exciting adventure will keep readers turning the pages and wondering what will be inside Pawan Mishra's next work. Overall, I greatly enjoyed reading Coinman: An Untold Conspiracy and I highly recommend it to all. Wonderful humor parody that speaks to you about the wisdom of life without you realizing. I heard about this book from my friend who reads a lot and who recommends books to me. He praised this a lot - so I had to read it. The book made me laugh so much. I loved the absurd satire and very well crafted english.